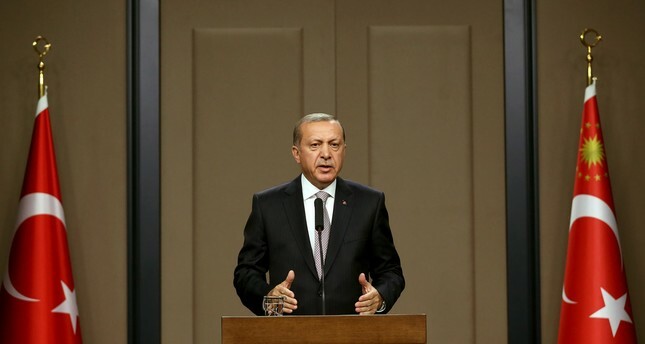 President Recep Tayyip Erdoğan said that the PYD forces had not yet retreated to the east of the Euphrates River in northern Syria despite claims by the U.S. that the group was withdrawing. Speaking to a news conference on Friday, Erdoğan said reports that claimed the PYD had retreated to the east of the Euphrates River were not true, adding that such development must be confirmed by the Turkish intelligence first. The president also said the Turkish-backed operation to cleanse north Syria from terrorists was going successful and a 400 km2 area had been cleared of Daesh and YPG terrorists. He also said Turkey had repeatedly proposed the establishment of a "safe zone" in Syria as a solution, but said the idea had not received the backing of other world powers. "Operation Euphrates Shield's aim is to remove the threat imposed by terror groups at our border. We cannot turn a blind eye to the rocket attacks fired from bordering towns in north Syria into Turkish soil," Erdoğan said. Erdoğan added that Turkey's operation into Jarablus was not an incursion and it was conducted to resettle the local Arab population back into their towns. On Wednesday, the Pentagon insisted that the PKK's Syrian affiliates were withdrawing to the west of the Euphrates in northern Syria. "The people we are working with, and the SDF [Syrian Democratic Forces]-the SDF is comprised of a lot of Kurds but other elements too-have lived up to their promise," Pentagon spokesman Capt. Jeff Davis said. According to Davis, the withdrawals have been taking place for about three days but local reports and some Turkish officials say the PKK's affiliate, the PYD, and its military wing, the YPG, in and around Manbij continue to hold villages west of the Euphrates. The PYD/PKK has long said it would not cross the river to the east and leave the areas captured from the Daesh terror group to the local predominantly Arab population. The PYD/PKK is trying to combine its self-declared Afrin canton in the northwest corner of Syria to the Kobani and Jazeera cantons in the northeast but Turkey and Syrian opposition groups fighting for the unity of Syria have been trying to prevent PKK affiliates' separatist motivations. Daesh originally controlled 98 kilometers of territory along the Turkish border. Ankara has warned that Turkish Armed Forces would address the threat posed by PKK affiliates in northern Syria as well but Washington wants Ankara to center its focus on Daesh.